Safeguarding your data is more important than ever. In today’s data-driven business landscape, companies are using their data to innovate, inform product improvements, and personalize services for their customers. The sheer volume of data collected for these purposes keeps growing, but the solutions available to organizations for processing and analyzing it become more efficient and intuitive every day. Reaching the right customers at the right time with the right offers has never been easier. With this newfound agility, however, comes new opportunities for vulnerability. With so much riding on the integrity of your data and the services that make it secure and available, it’s crucial to have a plan in place for unexpected events that can wipe out your physical IT environment or otherwise compromise data access. The potential for natural disasters, malicious software attacks, and other unforeseen events necessitates that companies implement a robust disaster recovery (DR) strategy to remain competitive. 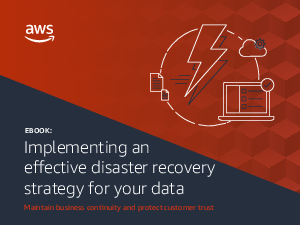 In this eBook, learn about types of disaster recovery solutions and which ones are a good fit for your company.